Unfortunately I have little time to write for my blog today as I am going to spend the day with my mother,I was sick with a bad cold last week so missed visiting her in case she caught it from me. Cancer patients immune system can be low, especially if they are on treatment, so I am always very cautious if I am sick myself as I do not want the risk of my mother getting pneumonia again. Today I wanted to tell the story about Africa and Lily, my sons Chihuahua and her solo puppy, this is a wonderful story and needs more than a few moments to tell so for now I will leave you with a photo of Africa and Lily and a quote by Polly McGuire from "Chicken Soup for the Soul". I felt it so fitting for my photo and the blog I will write on them tomorrow. Please do not reproduce this photo. 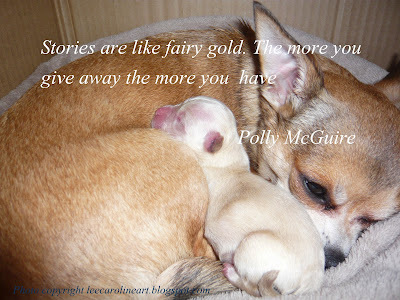 Credit for the quote goes to "A Cup of Chicken soup for the Soul" - Stories to Open the heart and Rekindle the Spirit. Please re-visit tomorrow to hear this delightful story.